What makes a good Tea Pot? There are many ways to prepare tea from traditional leaf style tea to tea bags to more ceremonial cha no yu, or tea ceremony. 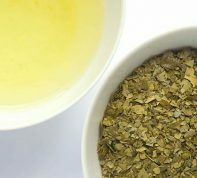 Even for leaf tea there are various instruments you can use to achieve the best result. Tea pot, mug strainer, some automated tea server, etc. 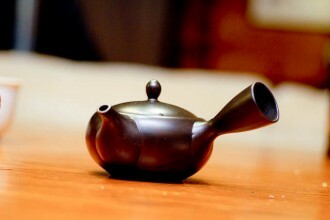 When I choose a tea pot, I look at not only the artistic look and feel, but also functionality and usability. Tea pots are carefully designed and crafted to maximize tea brewing result as well as ease of use. Good tea pots also give great feeling and confidence since they always perform at the best. We will look beyond casual use and ease of cleaning. Shop Online for Tokoname Clay Tea Pots. Clay, ceramic, glass or metal? What material is used for tea pot can sometimes make difference. I like using red clay pot or pottery clay. Red clay has finer pore than pottery clay. Ceramic and glass are considered to have no or very little significance of pore. These pores in tea pot clay can make tea taste milder in certain types of green tea. Also clay tea pots absorb oil and aroma and over time they start to obtain more aged look and unique aroma which is released as tea is made. Many people swear that yixing tea pot makes the best brewing, but we need to be aware that the clay also has different grades much like tea leaf. Not all clay from yixing works in the same way. I have conducted blind test to see which makes the best tea. I like clay pot for green tea for Mauna Kea Green Tea Spring flush and summer as well as Japanese sencha in many different grades. 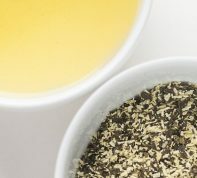 In the end, we need to be aware that water quality affects the taste of the tea so clay type is not the only factor, thus I suggest you to find your favorite combination. Beside clay pot, I use ceramic and glass pot sometimes. Ceramic and glass tend to exaggerate the bitterness and astringency of tea so I like to use when I like to enhance certain characteristics or do taste test. I cannot find good glass tea pot. Perhaps the production process of glass pot makes it difficult to form certain shape. Side Handle or Back Handle? Generally I prefer to use side handle over back handle for green tea due to ease of use and greater control. Side handle tea pot is used commonly in Japan. 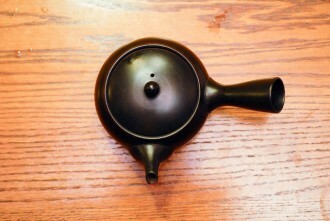 Side handle tea pot gives advantage to preparing sencha (Japanese green tea). Sencha goes through steaming process which makes extraction of tea much quicker compared to pan fired leaf tea. Depending on the server’s hand motions, he or she can make this tea quite different. Quick back and forth movement of the hand motion makes this tea pot rather convenient and practical. Spout and handle appear to be placed in 90 degree angle in a casual manner. Yet, the angle is slightly less than 90 degree. This precise placement allows the server to flip the tea pot from upright position to pouring position in natural flow and achieve the spout to point directly downward into a tea cup. A potter / tea pot designer who specialises in tea pot production told me that this handle-spout angle has something to do with morphology of the wrist and the hand when I visited his studio in Japan. He also showed me one that was placed at precisely 90 degree, but the tea pot was somewhat unnatural to use. 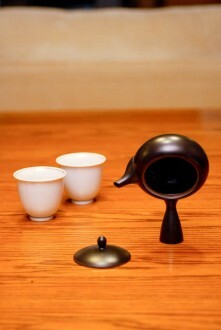 This is generally due to spout design, but the body of the tea pot also have to match with the function of the spout. A good tea pot spout design gives clean stream of pouring water. A good tea pot can achieve a perfect seal. It means that when you pour water in the pot and plug the hole on the lid with your finger and hold the tea pot in drain position, there should be no water coming out of the tea pot. It often get more difficult with larger tea pot, but well designed tea pot can do this even when the tea pot capacity is 300ml or more. Personally I like clay or ceramic strainer over metal strainer. Some tea pot designers just poke some holes on the body of the pot while others attach fine clay strainer. The tea pot strainer shown on the picture is made of the same red clay as the tea pot. Metal strainer can leave some metalic taste in tea especially when the tea pot is new. 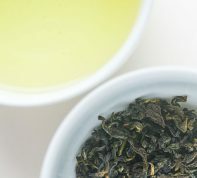 If you prepare really high grade tea, such as contest grade, occasionally delicate taste of the tea itself can be affected. 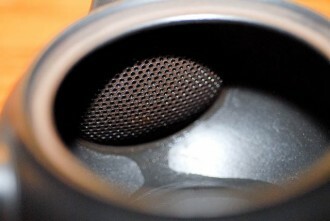 Drop-in strainer can make it easy to clean afterward, but it restricts the movement of the leaf. Good tea pot can make a good tea as well as show a great trick. Tea pot does not have to sit on the bottom all the time. If a tea pot is made precisely balanced, it can stand on its handle. There is no Photoshoping done on the photo. This is also a part of the tea pot design for usability. Tea pot is much like a brush for a calligrapher. It is still the talent and the skills of the artist that paint, yet it results in the subtle difference of good work and great work. Although these things I talked about are not necessary in everyday preparation of tea for your enjoyment and people should use their own preparation method of what they feel comfortable with, I prefer to take time and make a good tea, paying attention to subtle details. I enjoy this meditative process. It is the whole process of getting my mind ready, preparing and drinking tea, that makes the tea taste and feels good.